If you're looking for unique gift ideas for your sweetheart, consider the lovely GIFTABLES Curved Heart 5" x 5" Frame from Beatriz Ball. 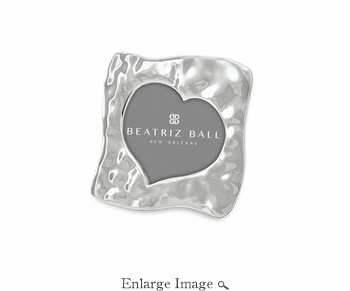 Distinguished by an abstract shape, and asymmetrical heart-shaped opening, this precious 5x5 inch silver frame is handcrafted in an easy care aluminum alloy. The Beatriz Ball photo frame makes a beautiful gift for loved ones of any age. From our GIFTABLES Collection featuring handmade and artfully designed Beatriz Ball items at irresistible prices. Packaged in a lovely gift box, the tarnish free silver frame makes an ideal heirloom gift for Valentine's Day baby showers, birthdays, and holidays. Sand-cast and hand-polished, handmade of an aluminum alloy. Tarnish free.